We have exciting news to share today! The next time you have exciting news to celebrate make this featured chocolate cake! This chocolate cake was made almost two months ago. We've had to keep our exciting news under wraps a little bit but now it feels right to share it on the blog. Two months ago we had our friends Romin and Mimi over for dinner and we all had something to celebrate! It just so happened that for Patrick's birthday in March they had given him a bottle of champagne (along with some other foodie goodies). When folks give us wine or champagne we like to save it and then hopefully share it with them. On this particular night it was fitting for us to have some bubbles! Romin and Mimi were celebrating his medical school culmination and acceptance to an intern program! We were celebrating an accepted offer on a house! For dinner we served Chicken Tetrazzini casserole and a mixed greens salad. Romin and Mimi provided the bread. Chicken tetrazzini is a great casserole for serving to company in my opinion. It's filling and, like all casseroles, has everything you need in one dish - pasta, veggies (peas), and protein (chicken)! Plus all the prep work is in the beginning and while it is baking you can clean the kitchen and everything will look nice by the time company arrives. 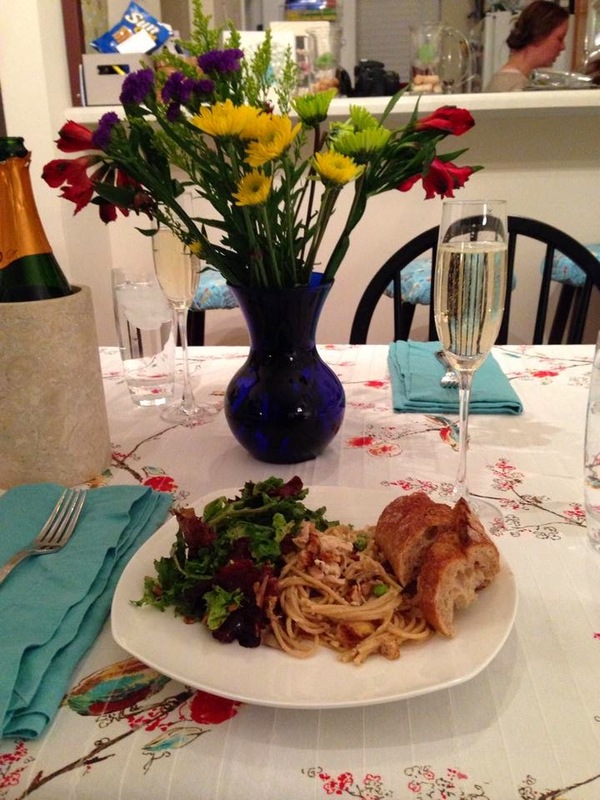 Mimi put this picture on facebook of the dinner and the champagne! Earlier in the week while I was planning the dinner I decided I wanted to make an actual cake! I found this Martha Stewart recipe and we all loved it. Make the cake: Preheat oven to 350 degrees. Butter and lightly flour two 9-inch round cake pans. In a bowl, whisk flour, cocoa, baking soda, and salt. In a mixing bowl, cream butter and sugars until fluffy. Add eggs, one at a time, beating until well incorporated. Beat in vanilla. Add the flour mixture to the butter mixture in three additions, alternating with buttermilk and beginning and ending with the flour mixture. Scrape bowl as needed. Pour batter into pans. Bake until toothpick inserted in center comes out clean, 25 to 30 minutes. Cool in pans 10 minutes before inverting cakes onto rack to cool completely. Make the buttercream: In mixing bowl, beat butter and marshmallow cream until fluffy. Beat in cocoa, chocolate, vanilla, and 1 tablespoon water. If too thin, refrigerate about 5 minutes. Place one layer on platter. Spread top with 1 cup buttercream. Place second layer on top. Frost entire cake with remaining buttercream. We had some cake leftover so I sent it with Patrick to work. It's been an exciting two months. Here's a catch up to present day on those April celebrations: Romin is officially Dr. Romin! 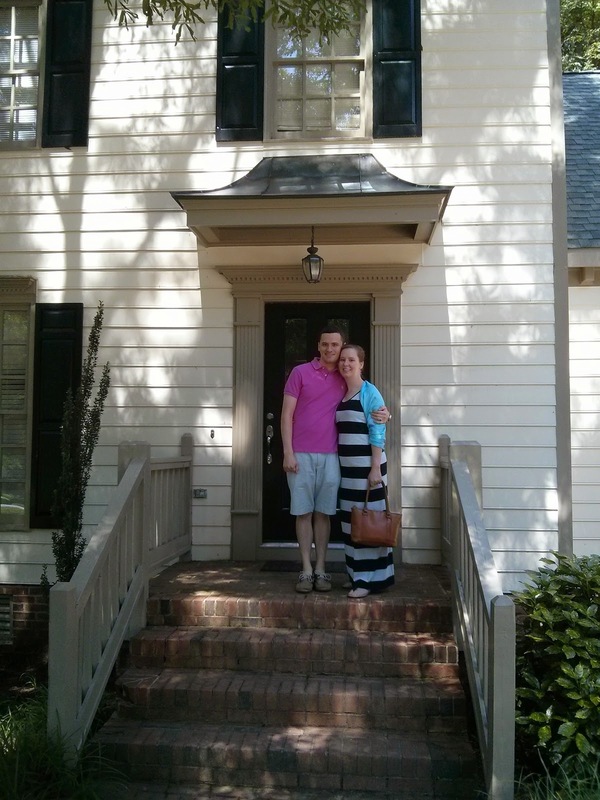 And six weeks ago we closed on the house. Here we are on our front steps! More details and pictures to come in the following weeks. No promises on a timeline ... I'll try to get some things up within two months! Congratulations to everyone! Of course, the house is beautiful. I hope Romin's internship is in Chapel Hill so you can all still get together.